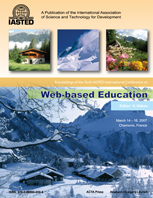 557-118 Web-based Education: What Is Next? 557-148 Web-based Inquiry Learning Environment "Young Scientist"
557-074 A European Project “Virtual Performance Centred Environment for Training in Nanoelectronics"
557-105 Children's Navigation of Hyperspace – Are Spatial Skills Important? The topics of interest include, but are not limited to: * Web-based Education (WBE) * Web-based Training * Online Education and Training * E-Learning and E-Training * Innovative Teaching and Learning Technologies for Web-based Education * Streaming Multimedia Applications in Web-based Education * Communication Technology Applications in Web-based Education * Mobile E-Learning * Collaborative E-Learning * E-Pedagogy * Web-Lecturing Technology * Innovative Web-based Teaching and Learning Technologies * Virtual Reality Applications in Web-based Education * Scientific Web-based Laboratories and Virtual Labs * Software and Hardware Systems for Web-based Education * Authoring Systems for Web-based Education * Multi-Agent Technology Applications in Web-based Education * Design and Development of Online Courseware * Reusable Learning Objects for Web-based Education * Educational Portals for Web-based Education * Virtual Universities and Colleges * Online Degree and Certificate Programs * Quality Issues of Web-based Education * Testing and Assessment Issues of Web-based Education * Best Practices of Web-based Education * National Policies and Strategies on Web-based Education * National Projects on Virtual Universities and Web-based Education * International Projects and International Collaboration on Web-based Education * Academia/Industry Collaboration on Web-based Training * Corporate Web-based Training * Web-based Methods and Tools in Traditional, Open, and Distance Education * Blended Education and Training * Faculty Development on Web-based Education * Dot-Com Educational Institutions and their Impact on Traditional Universities * Funding Opportunities for Projects in Web-based Education.